Our log cabin can provide you with a Smoky Mountain family vacation, a romantic honeymoon, or a perfect mountain getaway. 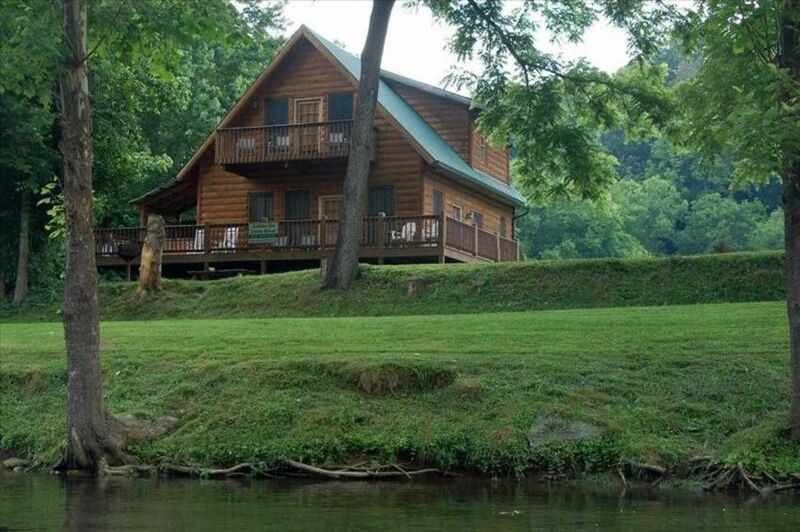 You will enjoy privacy, comfort, and convenience in a beautiful log home overlooking The Little River. Our cabin is nestled away on a bank overlooking The Little River in the heart of Townsend, Tennessee, the most laid-back and relaxing community in the Great Smoky Mountains. Also known as 'The Peaceful Side of the Smokies.' Just 2-miles from your cabin door lies the entrance to the Great Smoky Mountains National Park and scenic Cades Cove. This cabin is family owned and operated and is a part of the Cabins on Little River , LLC We provide personal service making sure every need is to your satisfaction. Our family has lived and grown up in the Townsend area all of our lives. We look forward to meeting you and helping make our cabin your perfect vacation getaway for years to come. *** 2019 TWRA TENTATIVE TROUT STOCKING SCHEDULE FOR LITTLE RIVER in TOWNSEND, TN Right in FRONT of our "FISHIN HOLE" Cabin !!! Location ! Location ! Location! and Personal Service by the Owners. We take care of our Customers. We appreciate your Business! Contact us for personal Service and any questions. Cabin Overlooks the 'LITTLE RIVER' on the Peaceful Side of the Smokies in Townsend,TN. Cabin is located on 16 acres of Farm Land. Your back yard neighbors will be our Horses! *There is a small Dead-end road between cabin and the river* River bank is sandy with grass sitting area. Water depth of 1'-5' GREAT FOR KIDS!!! Cabin Overlooks the 'LITTLE RIVER' on the Peaceful Side of the Smokies in Townsend,TN. Enjoy our "RIVER WALK" for easy access to River! Lounge chairs and seats Provided for up to 6 People! Up to 2 Vehicles ! Our cabins are Motorcycle Friendly with Level Drives to Cabins! High Speed Wireless Internet by Comcast Cable Throughout Cabin and at our "River Walk" Location on Little River! New 8- Person Kitchen Table for 2019 Season! NEW 52 inch LED HD TV in Living Room WITH ADDITIONAL 32 inch HD TV'S in LOWER Bedroom & UPPER FRONT Bedroom with Comcast Cable. Movie, Sports, Children , and Family Channels! GREAT VIEW OF RIVER FROM PRIVATE UPPER BEDROOM BALCONY!! You can Tube, Kayak, or Canoe in Little River right in front of the Cabin! YOU HAVE 600 SQ. FT. OF DECKING TO ENTERTAIN ON OVERLOOKING THE 'LITTLE RIVER' ! Cedar Log Porch Swing and Additional Seating! Easy Access to the river via our "RIVER WALK". Large Wide Concrete Stairs with Concrete Walkway and Sitting Area Along "Little River' ! Motorcycle Friendly with a level gravel drive to Cabin! Private 7 - Person HOT SPRINGS HOT TUB SPA overlooking the Little River!! Great cabin but in need of a lot of TLC. It has been used and not maintained. looks old and dirty. Nothing welcoming. When you drive up the shrubs are overgrown, there are big cobwebs in the windows on the outside and the windows are filthy. The stepping stones to the steps are all uneven and being overtaken by gravel and dirt. A fall risk for sure. The steps and deck are in bad need of pressure washing and are definitely a fall risk when wet. On the inside it looks clean when you first look then you begin to notice: cobwebs on inside of windows and windows dirty, slight smell of mold when first enter cabin. When take shower in master definitely smell mold. No vent fan in either bathroom. Dirty knife and fork drawer in kitchen. The stove was a disgrace. Cooking eyes were uneven and the trays were dirty. In the light over the stove a regular light bulb was stuck in instead of an appliance light and the cover replaced. Side of refrigerator was rusted. When look at living room floor it is either dirty or just worn, Upstairs has no decoration except for a couple of things on the vanity. Those who sat on the covered sofa said it was so worn out you leaned and were uncomfortable. That is all I can remember at this point. When you pay as much for a place as this you expect to walk into some place that is maintained, comfortable and decorated. Big disappointment. With updates and cleaning would be perfect as the cabin design and layout are great .Have to say the owner is responsive as we didn't have enough toilet paper on arrival and he brought some that evening. Also no fire alarm. The pictures are so misleading. We truly enjoyed our stay at the cabin. We brought our own inner tubes and walked up the road a bit and got into the river and floated down getting out at the cabin. We roasted marshmallows over the fire pit and also used the hot tub which was a great ending to the day. We also fished and laid out on the concrete dock at the cabin. You are only about 18 miles to pigeon forge and did that trip a couple times. There are some fun stores to stop at on the way. There is also zip lining and horseback riding about 10 minutes from the cabin which we did as well. The cabin has everything you need and we had an awesome vacation and will definitely be back here again. We enjoyed our week at this cabin. The cabin was peaceful and well-equipped. The one thing to know is that, depending on the day, the tubing may interrupt fishing. Overall, that was not a problem but the kids did get a ton of 'what have you caught" etc. from the many that tube in front of the cabin. The location feels secluded but has fast and easy access to the grocery store, various restaurants, etc. It was worth the time to stay here and we enjoyed meeting the owner as well. We would definitely be open to returning to this cabin! Great cabin that had all the comforts of home. We loved the beautiful view of the river and the convenient location to Townsend as well as the entrance to The Smokey National Park. This 3BR 2bath cabin had all the comforts of home for our group of six. We had a lot of rain during our visit so we were not able to enjoy the campfire as much as we would like, but the campfire set up was perfect. The hot tub was an extra bonus. We would definitely like to return to this property. Thank you to Richard for sharing your cabin with us!! We had a great time at the Little River cabin. We enjoyed spending time on the porches and down by the river. My niece loved the horses and they were so good with her. My wife and I went here for our first time and really enjoyed it. The cabin was great! Clean and well cared for with everything we needed! We have stayed at many places in the Smokies but this may be the best yet! Owners are a pleasure to deal with too. We will definitely look to return in the future. Catching beautiful Rainbow Trout on 'The Little River' in front of your Cabin, Wildlife Viewing in Beautiful Cades Cove (10 miles to Entrance) and 1- Mile to Great Smoky Mountains National Park Entrance, Tubing & Swimming on 'The Little River' in front of your own Cabin, Golfing (Laurel Valley 4 miles), Amusement Parks ( Dollywood 18 Miles ), Shopping in nearby Pigeon Forge (15 miles), Snow Skiing ( Ober Gatlinburg 18 miles ), RELAXING ON RIVER BANK IN FRONT OF YOUR OWN LOG CABIN!! !